The new pull-out resistance “Fastfit Grip” pipe coupling and flange adaptors for PE and PVC pipes. Hegawa now introduces the new pull-out resistance “Fastfit Grip” pipe coupling and flange adaptors for PE and PVC pipes. 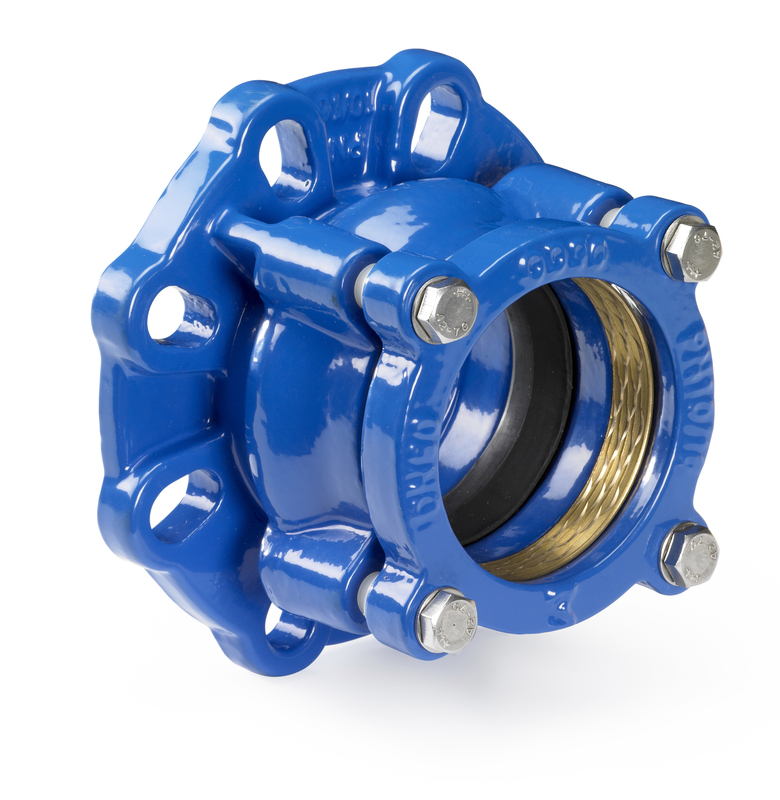 The coupling consists of a sleeve that is placed between two end-rings. Between end-rings and sleeve, grip rings, press rings and gaskets are positioned. The end-rings are pressed onto the sleeve when the bolts are tightened. The rubber gasket, pressed by the press ring and grip ring, then completely fills up the space between pipe and coupling. Because of the strong compression and the high quality of the rubber gasket, the pressure on the ring that guarantees the leak tight sealing, will remain on the required quality level for many years. By tightening the bolts the press ring and the grip ring will press the gasket inside, until the press ring makes contact with the sleeve. From than on the brass grip ring starts to reduce it’s diameter, and the sharp profile of the grip ring starts to cut into the PE pipe. After the bolts are tightened, until a metal-metal contact is reached, the coupling is ready for use. 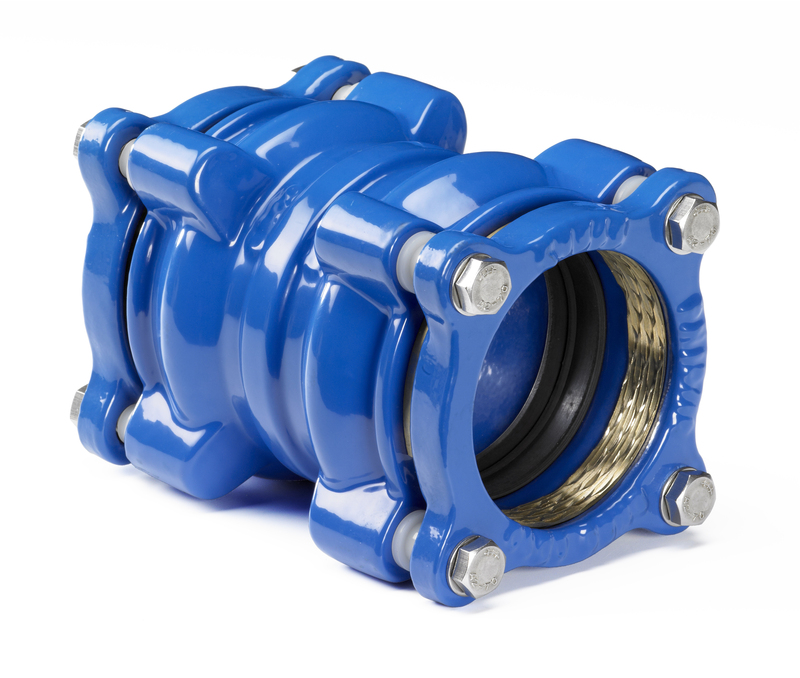 Pre-assembled delivery of all types of couplings and adaptors (no dismantling is needed before use). A minimum of different parts. Nut protected against turning during tightening. No high skills needed to install properly. Metal to metal contact indicates a proper instalment. Over-tightening is not possible. PE pipes can easily be inserted by over-dimensioning of the grip ring and gasket inside diameter. Even at max. tolerance of the pipe diameter, no chamfer of pipe ends is needed. Designed for PE and PVC pipes. Flange adaptors follow DIN, BS, and Ansi PN 10/16. (for more details see product brochure). No support liner necessary for PE/PVC PN 10/16 quality. Only three bolts for sizes up to DN 110, four bolts for sizes up to 180, five bolts up to DN 280 and eight bolts up to DN 315. End rings, press rings, sleeves and adaptors are made of high quality ductile iron GGG 450-10. Grip rings: brass MS 58 up to including DN 300. Rubber gaskets: EPDM grade W.
Bolts and nuts: Dacromet coated steel bolts. Stainless steel bolts in grade A2-70 are available on request. Coating: Dupont Alesta epoxy powder coating. Extra product information plus size details are available inside the product brochure. Let us know if you have an interesting project and want to work together or you need further information regarding our products! © Copyright - Hegawa B.V.